Choosing between a salt scrub and a sugar scrub can be difficult. Especially if you are not sure about the differences of each one. In this article we will discuss the differences, benefits and usages of salt scrub vs sugar scrub, and why you should have both of them at home. Our whole body needs exfoliation to remove dead skin cells, unclog pores and improve its circulation. A sugar scrub and a salt scrub will both fo the job but there are some things you want to take in consideration depending on your personal needs. With both scrubs, it’s important to check if they contain oil or any kind of moisturizer. If not, it is highly recommended that you moisturize well after exfoliating with any kind of scrub since your skin will be open to absorbing any moisture and nutrients. Usually is more abrasive than sugar since the salt granules have sharper edges. It is great for removing dead skin. They help improve blood circulation by inflammation. The biggest difference between sugar scrubs and salt scrubs is that salt scrubs offer therapeutic benefits since they are filled with minerals like calcium, magnesium, copper, iron. You will need to get a salt scrub with the salt of the Himalayas, salt flats in Utah, mediterranean sea or the dead sea. It’s recommended to use these scrubs once a week, preferably in a bathtub so you can let your skin absorb all the minerals. Salt scrubs are great to remove stains from your body. They are especially good for the feet, heels, elbows, knees and any other areas where you usually get discolourations since the skin is very thick there. Have you ever shaved your legs and gone to the beach right after? If you have, you’ll know that swimming in the ocean after shaving can be quite uncomfortable. Since the skin is very sensitive from recent shaving the salt can worsen the sensitivity. Salt scrubs can sting sometimes and therefore is not recommended if you recently shaved or went through any kind of hair removal procedure. Salt scrubs not only exfoliate the body but they also detoxify it. They work the same way sugar scrubs exfoliate since they both remove dead skin cells. But salt scrubs help pull toxins out of the body and reduce inflammation. Many people who participate in sports or athletic activities use salt scrubs on a regular basis since it helps with muscle soreness. Salt has antiseptic properties but you need to know what kind of salt to use. Epsom salt is amazing for your body since it has a high magnesium content. Magnesium is great for muscle tightness and soreness, it promotes blood circulation and promotes mental focus and concentration. Sea salt is amazing for letting your body absorb all the different minerals. If you buy a good quality sea salt scrub you can get up to 84 nutrients in it. Nowadays our food has fewer minerals due to improper farming and monocultures so using sea salt scrubs can provide you with some extra minerals that you might not be getting otherwise. DO NOT USE A SALT SCRUB IF YOU ARE SUNBURNED. The granule of sugar is rounder and therefore is more gentle on the skin. They do not contain the mineral content that salt scrubs do but they have their own benefits. Also, perfect if you shaved recently since this won’t sting on your skin (unless it contains lemon). They are less drying on your skin (perfect for the ones of us who have dry skin) and they contain glycolic acid which helps to even out the skin tone and evens out the texture. It also dissolves easier onto the skin when it’s left on. Sugar scrubs are especially recommended for the face area, neck area and lip area since the granule is less abrasive it’s perfect for the sensitive areas of the body. This said that does not mean you cannot use this on the rest of your body. 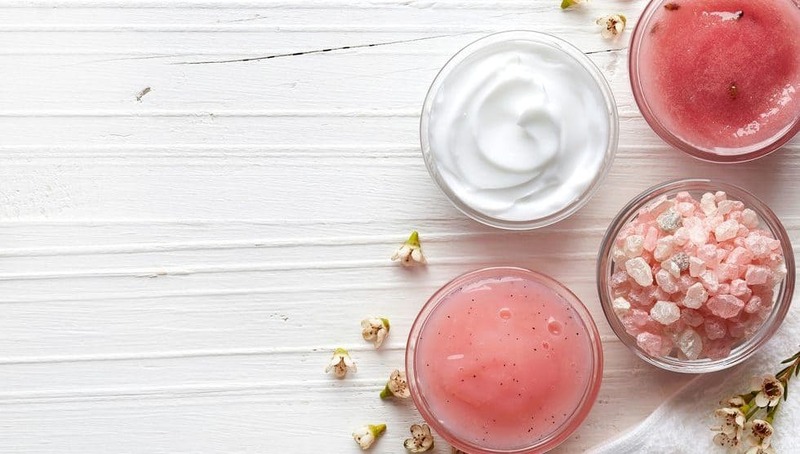 If you have dry skin or simply quite sensitive skin on other areas or even your whole body, then a sugar scrub might be the best option for you. Also if you are new to exfoliation you might want to start with a sugar scrub. The only sugar that also has a mineral content is unrefined cane sugar. Unrefined sugar is more abrasive than regular sugar so its not recommended to use it on the face area. You can use sugar scrubs 2-3 times a week. While you can make your own scrubs at home there are also some amazing products that you can get online. We talked about how good Shea butter can be for moisturizing the skin, therefore this Tree Hut Body Scrub (Linked to Amazon) is amazing. It contains Shea butter (anti-ageing), Moroccan rose oil (adds a glow to the skin), avocado (creates healthy skin), macadamia seed (reduces skin damage) and more. Using sugar as the granule means that it’s great for delicate and sensitive skin since it will remove the dead skin cells without damaging your skin. Here we also have a brown sugar scrub. Brown sugar is great for the face since the granule is delicate and will slowly melt onto your face giving you an extra smooth result. Brooklyn Botany Brown Sugar Scrub (Linked to Amazon) is made with high-quality brown sugar which ensures that it contains glycolic acid that works as an anti-bacterial and helps keep your skin younger and with a fresher look. This is also great for people who have sun marks on their face and have sensitive skin. Many products out there can be very aggressive for the face, therefore, this sugar scrub is a great choice. Brown sugar also promotes moisture absorption and helps to keep it in the skin giving a natural glow. If your whole body is very sensitive to exfoliation using this sugar scrub could solve that problem. If used as a body scrub it can also help reduce cellulite, varicose veins, stretch marks, and acne. If you are looking for something more revitalizing Asturas Gentle Exfoliating Body Scrub (Linked to Amazon) might be something for you. This body scrub contains 100% pure dead sea salt. It is great for removing dead skin of the legs, arms, stomach and body areas that are not too sensitive. It is filled with minerals which are absorbed after that the top layer of dead skin has been removed. It’s great for dry flaky skin since It is combined with essential oils and coconut oil to moisturize your skin at the same time that rejuvenates it. The best thing about this body scrub is that has no synthetics chemicals, or added fragrances and colors. If you have a bathtub this is a great addition to your exfoliating routing since the presence of minerals and essential oils make this product therapeutic. Last but not least we have The Ritual of Hammam Body Scrub (Linked to Amazon). This body scrub is a bit more abrasive since it’s great for areas with thick skin. It’s especially good for legs and feet. It exfoliates your skin in combination with Ginger, Eucalyptus and rosemary. This combination used to be used in Arab and Turkish baths. Ginger works as a warming agent which will leave your skin feeling tingly and new. The eucalyptus has relaxing properties and is good to inhale through the steam of the shower or bath. It helps clean the respiratory system. Rosemary has a warming effect that combined with the ginger gives amazing results. It also promotes skin repair from sun damage and premature ageing. Acne is a skin condition that causes inflammation and as a result develops spots and pimples, especially on the face, shoulders, back, neck, chest, and upper arms but it is not too rare to also develop it on stomach and legs. Our face is one of the most sensitive areas in our body, therefore, we need to be cautious with what products we use there. Especially If you suffer from acne you might have also developed acne scars so here we will talk about what scrub will work best to reduce the appearance of acne and minimize the presence of scars. To reduce scars it is recommended to find a sugar scrub that also contains a bit of lemon since it helps to reduce skin irregularities It is a natural astringent and whitening agent. The exfoliation needs to be gentle therefore we use sugar since the grains will be gentle for the face. Don’t use a salt scrub more than 1 time a week unless indicated otherwise. We talked about salt scrubs being good for muscle soreness but they also help reduce inflammation of ingrown hairs. Salt scrubs are especially good for the knee area, heels and feet if you have skin discolouration. If this is the case do not use a salt scrub since it might promote skin sensitivity. The scrub might be very abrasive for your skin and it might result in stinging, redness and even inflammation. This is the perfect scenario to use a salt scrub. It will remove all the dead skin cells and prevent ingrown hairs. Therefore this is perfect to use before any kind of shaving or hair removal. Remember to use a moisturizing agent after a salt scrub since it can leave your skin feeling dry. It’s good to use coconut oil or shea butter oil since those two provide additional benefits. The coconut oil is antibacterial which will help prevent any infection from taking place and the shea butter has anti-ageing properties. Using a salt scrub once a week on the legs, arms, stomach and back to pamper your muscles and absorb some minerals. Use the salt scrub before any type of hair removal to prepare the skin. Moisturize after using the product. Preferably when the skin pores are still open (right after taking a bath or shower). Use a sugar scrub 2-3 times a week on the face, neck, lips, and even your whole body if you’d like. Use it after any type of hair removal to reduce the possibilities of ingrown hairs and to bring back the natural glow of your skin. Also, moisturize your body after while your skin pores are still open. If you feel like the salt scrub is too harsh on your skin, there is also the possibility to combine a bit of sugar scrub with a salt scrub to make it less abrasive. Do not use this on the face since it might still be too rough for sensitive skin and do not use more than once a week even if it’s combined with sugar. Salt scrubs and Sugar scrubs will both exfoliate your skin but if you want the best results you should use them accordingly. Avoid using salt scrubs on the face since the salt will produce microtears on your skin. Salt scrubs are great for baths and saunas since you can let the minerals soak in. Sugar scrubs are great for the face, lips and neck area since those body parts are very sensitive. They are also great for constant usage, especially if you want to exfoliate your body 3 times a week. If you use a salt scrub more than once a week you might get the opposite effect. Your skin might end up drying out more.